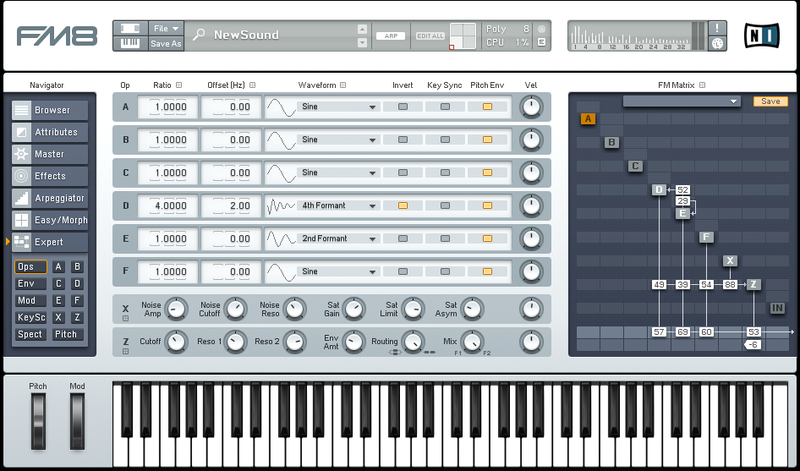 Today we are going to be making a super funky electro distortion synth bass from scratch in Native Instruments FM8. I will give you a quick overview of the set-up and then take a closer look at some of the settings so you can recreate this sound yourself. At the end of the tutorial, you will hear an example of the sound on it’s own and with some backing instruments so you can get an idea of how this type of bass can be put to good use. One of the things that really allows this sound to work is the simplicity of the design. 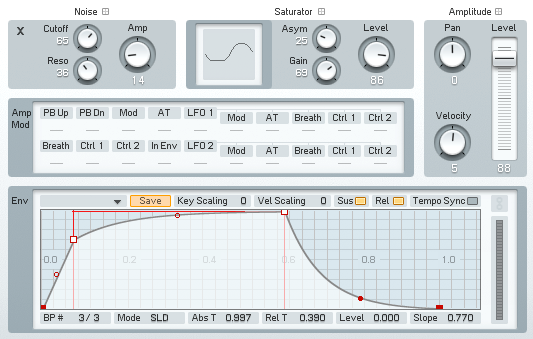 Just because there are a thousand and one features and parameters to play with, it’s a good thing to touch as few as possible when designing a synth such as this. As you can see in the FM Matrix, we are going to be using three operators, and both the X and Z operators which give us the chance to use some saturation and filter the sound a bit. Let’s get a closer look at what we actually have set up behind this matrix. For operator F we have a loaded a basic Sine wave and made a small adjustment to the envelope. It is then routed both through a filter and directly to the output, as each of the three main oscillators will do. Operator E has a 2nd Formant wave loaded and is a little more involved because we also add some feedback, as well as feed it into operator D as well. Operator D has an inverted 4th Formant wave loaded and is otherwise much like the other two. So far, a very simple sound. Now we set up our X operator and make a few changes to the default parameters. Here is the setup for the Z operator. As you can see, the envelope is a little unique, as are some of the parameter settings above. It leaves the filter curve looking a little odd, but believe me it will work in the end. 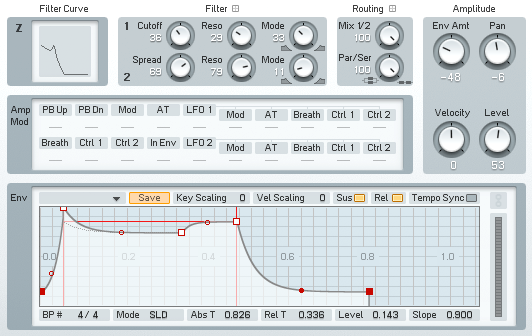 Now we set up an LFO to work on all three of the main operators, but on operator D it is set to modulate in the opposite direction to create the sound and movement we want from our bass. 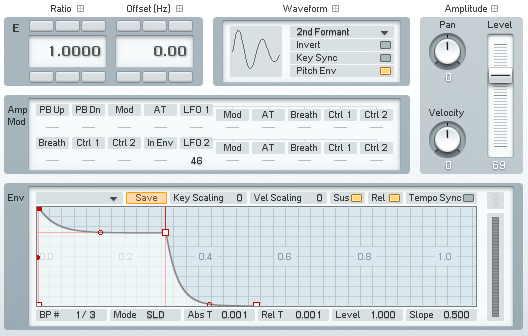 The last step is to set up the arpeggiator. Often times, when I know I want to have a fairly complex program in this screen, I will start out with a preset and then tweak it to my liking. For this instance, I went with the ‘Odd Enough?’ preset and then made the necessary changes. I wanted the sequence to be simple and funky, and I think this fits the bill alright. 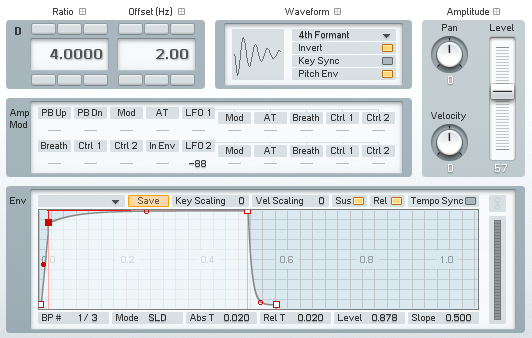 With the slight tail heard at the end of the synth, it will work well in some cool electronic styles of music. Of course, it is easy enough to cut that off for a cleaner sound. Here is an example of the synth playing through the sequence on it’s own. 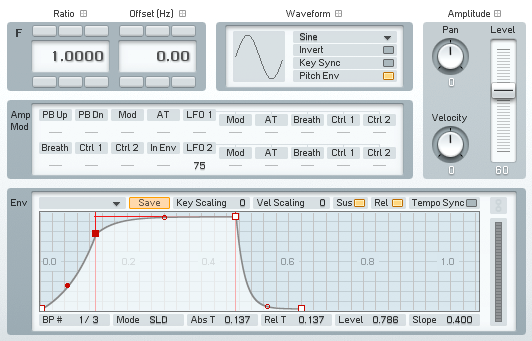 There is a second example below with it playing along side some drums, a shaker and a small, secondary synth element. These are just basic sound clips, no major mixing or mastering is added. Hope you enjoyed this quick tutorial. If you have a request or want to share one of your own sounds with the rest of the community, send us a message letting us know!